Carolyn: Your father always wanted you to have this for the right girl. Addy wasn't right clearly. Derek: You spent less than an hour with Meredith, you barely even know her. Carolyn: I know enough. I know its easier to have compassion for a good person than a murderer. I know how angry you are about what happened to Dad. Derek: Of course I'm angry. Aren't you? Carolyn: I still can't sleep on his side of the bed, the mattress is wearing unevenly. But no, no, not angry. Not anymore. Oh sweetheart, you see things in black and white. Carolyn: You need a spoonful of that. You need her. She's the one. Mark: Mrs. Shepherd's coming... to Seattle? Mark: So that woman practically raised me...taught me right from wrong. 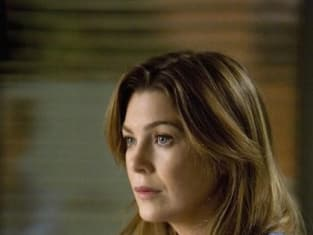 If she found that I was ... with you ... that we were... You're Meredith Grey's little sister. You are forbidden fruit. You are twenty-five. You're a fetus. Lexie: Twenty-four. I skipped third grade. Mark: Why do you have to live in Meredith's attic? How am I supposed to sneak out of here with a frat party going on downstairs? Don't you kids ever sleep? Lexie: They're cleaning the house for Dr. Shepherd's mom. Derek: You are wearing an alarmingly high ponytail. Meredith: Your mother is coming! Shut up! Respectfully. Respectfully shut up. Because we've got organs. I think it's nice. Your date. I think you and the pig murderer make a really good couple. Carolyn: You've been avoidng me. Carolyn: You've got that same look on your face as you did when you were ten years old. You put Derek's favorite frog into the microwave. Carolyn: How many sexual partners have you had? I won't judge. Lexie: Six. No, seven. Kind of six. Kind of seven. Lexie: It wasn't too ... it was way too fast, but I was downhill. I was coasting, ma'am. Carolyn: Now I don't suppose you can tell me ... where the gift shop is? Mark: Pain and agony for a little bit of pleasure? I get it. Callie: If it's that bad, why don't you stop sl- ... doing what you're doing. Mark: Because it doesn't feel bad when I'm ... doing it. It's good. It's great. And maybe if you weren't so scared of getting burned, you'd feel the same. You don't think that I know that they just pulled the plug on the kid? You don't think that I get that? You don't think I know about the tiny, tiny coffin that they're going to stick him in? I know about the tiny coffins. I see them all the time. In my sleep. So if you don't mind, I'm going to keep talking relationships and rainbows and crap. And I'm going to make plans for tomorrow. Because that's what you do, Karev, you make plans. You have to. You turn your back on the tiny coffins and you face forward, Until the next kid.